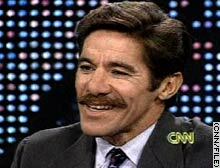 WASHINGTON (CNN) -- Fox News Channel correspondent Geraldo Rivera is being expelled from Iraq for broadcasting details about future U.S. troop movements in the country, according to the Pentagon. The veteran correspondent, who was temporarily accompanying the Army's 101st Airborne Division, violated the rule during a live broadcast on Fox television. "He was with a (U.S.) military unit in the field and the commander felt that he had compromised operational information by reporting the position and movements of troops," Pentagon spokesman Bryan Whitman told Reuters. "He will be dropped at the Kuwaiti border," the official said. "He went down in the sand and drew where the forces are going," said a stunned senior military official. "He gave away the big picture stuff."